Your Vision. Your Goals. Your Vision. Your Goals. Today I challenge you to discuss your life goals with your loved one and write them down. Have you completed your Mission Statement from Day 27 Love Challenge? A mission statement defines what your family is, why it exists, it’s reason for being, and what you value. Your Mission Statement is the first step in your rebuilding process. The next step in your rebuilding process is establishing your goals. I encourage you to discuss and write your individual, relationship, and family goals for 2015. A goal is a desired result that you envision. When we know what we want to achieve it helps us to concentrate and improve in that specific area and it helps us to make that goal a priority in our life. The end of the year is a great opportunity to reflect upon how the year went and the changes you desire for the upcoming year. Discussing and setting your goals with your loved one can truly build love in your relationship. Goals can drive you and your loved one forward, provide clarity on your vision, give you focus, hold you accountable, and push you to be your best. You want your goals to be specific, measurable, attainable, relevant, and time bound. Here's a formula that you can use to discuss and write your goals with your loved one: S.MA.R.T. Goals S-Specific- A specific goal clarifies the who, what, when, where, why, and how. For example: "I want to lose weight" is a general goal. A more specific goal would be, "I want to lose 20 pounds so that I can live a healthier life." M-Measurable- A measurable goal will help to track your progress. For example, "I am going to workout four times per week." Attainable- An attainable goal is realistic. In this area we have to be honest with ourselves about what our limitations are, however we also have to be open and willing to push and stretch our selves in ways we have never done before. Setting a goal to travel a to new country every month, but you do not have a passport is not a realistic goal. A realistic goal for this scenario would be to get a passport first. Relevant- A relevant goals matches your needs and adds to your life's vision. Time Bound- A time bound goal has a due date. Goals with a due date keep us on track and hold us accountable. Be sure to write your goals in the positive, prioritize goals based on where you want to start first, break the larger goals down into smaller goals, track your progress, and reward yourself as needed. Be mindful to keep your rewards aligned with your goals. For example, rewarding yourself with a large purchase item because you met your goal to pay off your credit cards may not be a reward that's consistent with your big picture goals. You can also include friends a family in this process. At the beginning of every year my husband and I host a Couple's Vision Board Party. We invite our friends over with their significant other, we provide all supplies for the making of the vision board along with appetizers & cocktails. We do ask that our friends and their loved one discuss their goals prior to the event and come prepared to put them on their vision board. The event is a fun-filled night with liked-minded couples. We laugh, we eat, we sip, and we create & share our vision board with one another. It's always a great way start to our year! A vision board is any sort of board on which you display images and words that represent whatever you want to be, do or have in your life. 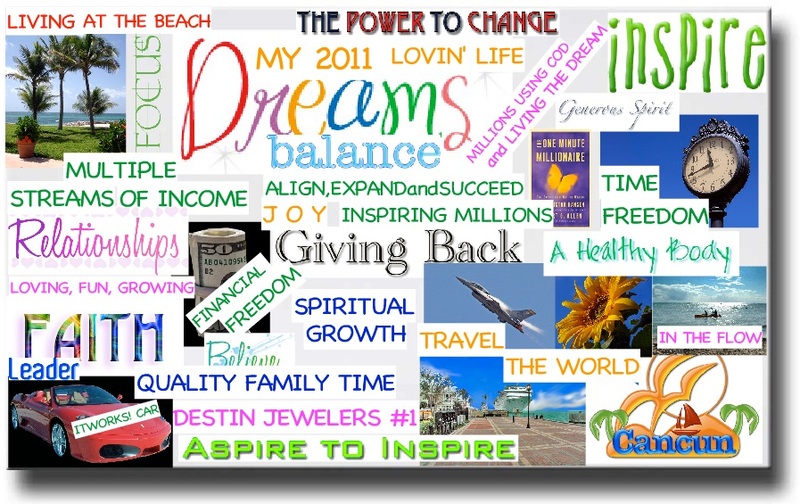 A vision board helps you to clarify, concentrate, and focus on specific life goals. One of the best parts of having a vision board is hanging it. We hang our vision board somewhere in our home that grants us access to looking it at every single day. Maintaining our vision on our vision board helps us reach our goals! An additional key factor to creating a vision board is to pray about where your life is headed next and what goals should be on your vision board at this stage of your life.